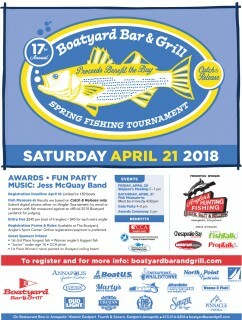 The Boatyard Opening Day Rockfish Tournament was the Boatyard’s first ever lifestyle charity event. Anglers Sports Center continues to be the Official Presenting Sponsor. See the pictures and fishing results from last year’s tournament under Gallery. 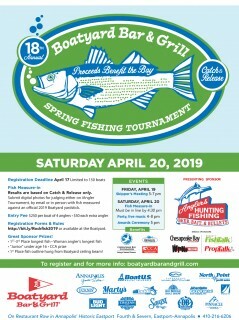 Chesapeake anglers excited about the start of the rockfish season can enjoy their favorite sport and support three great causes by entering the Annual Boatyard Bar & Grill Opening Day “Catch & Release” Rockfish Tournament. Participating fisherman not only compete for great prizes, they also give back to the Bay and their community since proceeds from the tournament benefit the Chesapeake Bay Foundation®, the Coastal Conservation Association Maryland and the Annapolis Police Department’s Youth Fishing Camp. By enjoying a day on the water with friends and a fun party, they assist CBF with their “Save the Bay” efforts, help the CCA-MD protect the fishery, and introduce local kids-at-risk to Chesapeake fishing through The Annapolis Police Department’s Youth Fishing Camp – these kids establish long-lasting bonds with Annapolis police officers at the camp, a two-week program run by Lt. Brian Della.